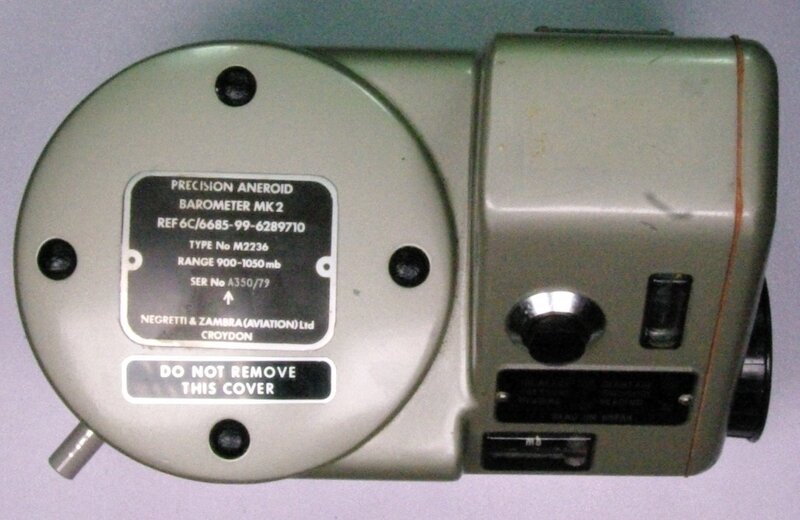 ​This is a Negretti & Zambra M2236 Typ2 barometer. It is an aneroid barometer with an odometer-type mechanical digital display. I'm guessing it has a manufacturing date of 1979 based on the serial number, which ends in '/79'. These barometers were typically used at small airports to obtain altimeter setting data. To operate the barometer, the large black button is held down and the knob on the right side is rotated until the green light on the barometer face changes. When the light change occurs, the digital display shows the pressure. It has a range of 900 to 1050 mb, with display to the tenth of a mb. The manufacturer's stated accuracy is +/- 0.3 mb at 20 C. It uses one 1.5 volt D-cell battery for power. Mine is set to local pressure and it works within specifications. Go to Negretti & Zambra catalog page.